Technic: Hand colored copperplate engraving on verge type hand laid paper. Condition: Good, given age. Original middle fold, as issued. Paper separation in top and lower part of middle fold, bached. Some small tears in paper edges, margins only, backed using contemporary paper backed with acid free archival tape. Paper edges chipped. Recent hand coloring. General age-related toning and/or occasional minor defects from handling. Please study scan carefully. Description: Antique print, titled: 'Pascaert van de Noord Zee van Ameland tot de Hoofden. - Mare Germanicum ab Amelandia ad Promontoria Caleti et Doverae.' Coastal chart taken from plates engraved for Frederick de Wit's maritime atlas details the North Sea between England and the Netherlands. The Frisian Islands are shown along the coast of Holland to just south of Dunkerque. The English coast is more generally described, but the sea is full of rhumb lines, soundings, a compass rose, and sailing ships. A decorative cartouche at bottom right that has figures representing the natives of the Dutch colonies trading with a representative of the Dutch East India Company. 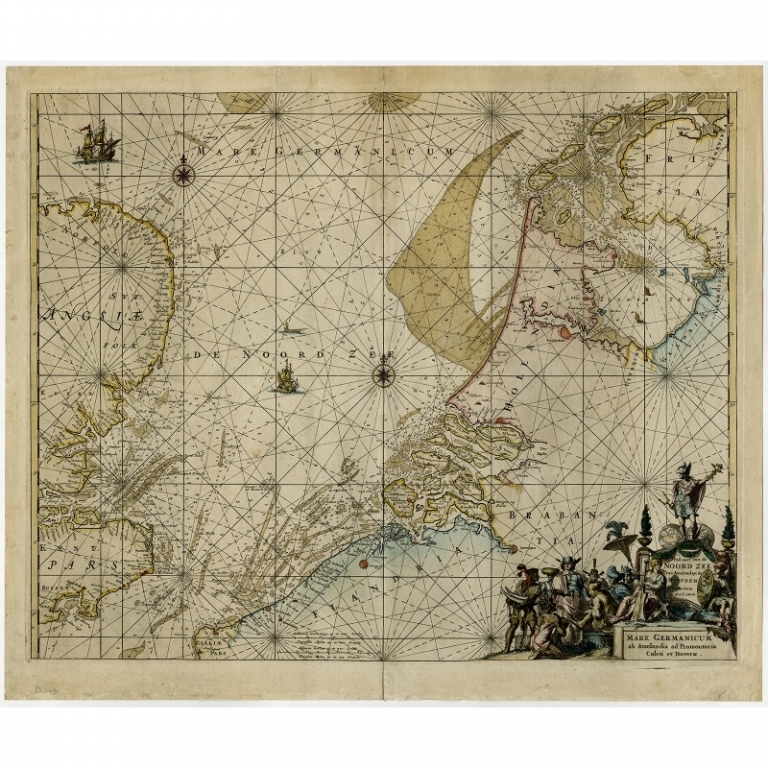 First published circa 1675, de Wit's sea atlas, Orbis Maritimus ofte Zee Atlas, contained 27 charts from the North Pole to North and South America. The charts all appear to have been engraved by Romeyn de Hooghe and are splendid examples of Dutch marine works. 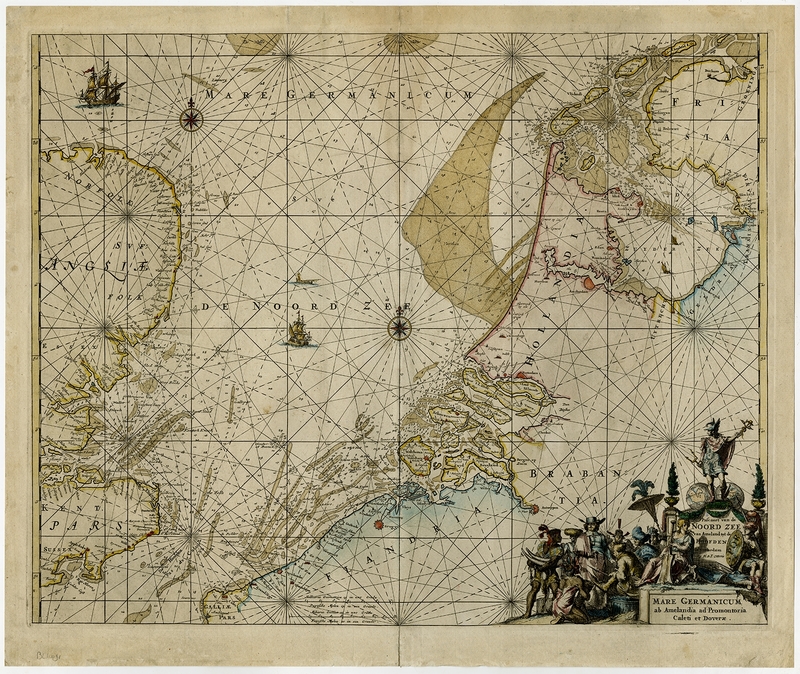 The atlas was reprinted with amendments by Louis Renard in 1715, by Reinier and Josua Ottens in 1739 and 1745, and finally by the widow of van Keulen in 1802. Artists and Engravers: Made by Romeyn de Hooghe. Publisher: R. & I. Ottens. Romeyn de Hooghe (1645-1708) was an important and prolific late Dutch Baroque engraver and caricaturist. De Hooghe was skilled as an etcher, draughtsman, painter, sculptor and medalist. He is best known for political caricatures of Louis XIV and propagandistic prints supporting William of Orange. During his career, de Hooghe produced over 3500 prints. He also illustrated books, and his illustrations can be found in some of the most important texts of his period. Publisher: Reinier and Joshua Ottens (both 1704-1765) are publishers, cartographers and map engravers from the Netherlands. The family business was founded by their father Joachim, but most productive during the time of Reiner and Joshua.